Many researchers and scholars judge that the largest part of the Balkan Vlachs is concentrated in Greece. The census of 1935 recorded 19,703 Vlachs in Greece, but according to the last census in Greece that allowed people to express their ethnic identity (in 1951), there were 39,855 Vlachs in this state. However, a real number of the Vlachs in Greece today is up to 120,000. The Vlachs in a post-war Greece are not acknowledged as an ethnic or national group for the very reason that Greece from the mid-1950s does not recognize an existence of any national or cultural minority on its own territory. The religious minorities are only allowed. The Vlach ethnocultural self-identity became extremely disreputable as a result of a Greek course of action of ethnic homogenization in the form of Hellenization of all Greece’s Eastern Orthodox inhabitants. Consequently, a great portion of the Greek Vlachs is Hellenophile. The part of the policy of ethnic homogenization was a practice to rename ethnic minorities in order to make as bigger as a gap between them and their home countries in the Balkans. Therefore, the Greek Vlachs have been renamed to the Vlach-speaking Greeks (similar to the Slavic Macedonians who were officially considered as the Slavophone Greeks). In general, cultural and travel relations between the Greek and the other regional Vlachs are limited by the Greek government like connections with the Romanian cultural and educational institutions. Probably the pivotal reason why the Greek authorities are not willing to open the Vlach-language schools and to allow the church service in the Vlach language is unpleasant experience with the same matter from the turn of the 20th century when a significant part of the Vlach community in Greece, following the Romanian propaganda and political support, fought for the Romanian-language schools and churches to be opened in the Kingdom of Greece. Although this requirement was rejected, the Greeks understood any further similar Vlach or Romanian action as interference into domestic affairs as politically incorrect steps. Nevertheless, one significant number of the Vlachs left Greece and migrated to Romania as a reaction to the Greek unwillingness to promote the protection of the Vlach ethnocultural identity. During the struggle over geographical Macedonia at the turn of the 20th century, the local Vlachs were totally defenseless from the military actions by the Serb, Greek and Bulgarian paramilitary and volunteer detachments. There were cases that the Vlach civilians have been tortured and executed by the Greek, Serb or Bulgarian nationalists. After 1919 the Romanian and the Greek governments signed a bilateral treaty (in force till 1941) about protection of the Vlachs in Greece according to which, the Romanian-language schools have been opened. The Romanian sponsorship over the Vlach minority in Greece climaxed in the interwar period and resulted in the revival of the Vlach nationalism. From this period exists an idea to establish the Aromanian Orthodox Church in Greece; an idea, which never was realized since it has been sharply opposed by both the Greek government and the Ecumenical (Greek) Patriarchate. Nevertheless, the socialist government of Romania after 1945 gave up the policy of financing the Romanian-language schools and churches in Greece. At the Balkans, the Vlachs are mostly concentrated exactly in and around the Pindus Mts. In Greece where there is an unofficial capital of all Greek Vlachs – a town of Aminciu or Metsovan. Those Vlachs from the Pindus Mts. area are still today nomadic shepherds, but another group of the Vlachs in Greece is urban settlers who are employed in medicine, free services, law, taxi driving, etc. The Greek Vlachs during the time of the Ottoman Empire dealt with shepherding, transportation of the goods by caravans and usually had a dominance in overland trade within the present-day territory of Greece, while the Greeks had a primate in the oversee trade business. The Vlach language, likewise any other minority language, is excluded from the public use in Greece. Some Vlachs have been endangered by imprisonment for the speaking the mother tongue on the streets. The Vlach, Macedonian, Turk and other emigrants from Greece reported that they have been persecuted in the Greek army for the reason that they used their own mother tongue. The general opinion of the ethnic Greek majority is that using minority languages is a proof that those speakers are culturally and intellectually backward in comparison to the Greek-speakers who use one of the oldest world languages in which the basic philosophical, literal and scientific works of the modern European and Western civilization have been written. An additional problem in regard to the negative attitude toward the Vlach language is that it is not standardized language and therefore is considered as the vernacular of less cultural and civilized populace. In many cases, the macro-community in Greece considers the Vlach micro-community as composed by not-working-loving and irresponsible members. From the matter of comparison, there was a significant difference between the minority position in Greece and in the former communist regional states before and after 1989. To be more precise, the minority and human rights in Greece until the end of the Cold War have been higher rated then those in Bulgaria, Romania, and Albania. However, Greece did not succeed to match the highest regional level of minority rights that was established in ex-Yugoslavia. However, after the political changes in the region in 1989 and 1990, the level of minority protection in Greece became lower in comparison with Romania, Albania, and Bulgaria. During the last 20 years, there are many complaints to the Greek minority policy expressed in the European Parliament, the Council of Europe, the OSCE and human rights NGOs. Greece is portrayed as a country where the minorities are exposed to the assimilation without enjoying some basic minority rights that are guaranteed by the international community and especially by the European Union whose member is Greece from 1981. Nevertheless, the treatment of the Vlach-speaking Greeks (as the Eastern Orthodox community) is better than of those minorities who are not of the same denomination as the Greeks are. A position of the Vlachs became after 1981 improved in comparison with the Slavo-Macedonian community for the very reason that the Greek government in Athens estimated that the Vlachs are not dangerous minority for the Greek territorial integrity. Additionally, after the (FYR of) Macedonian independence was proclaimed in 1991 the Greek Macedonians are seen as serious potential separatists. 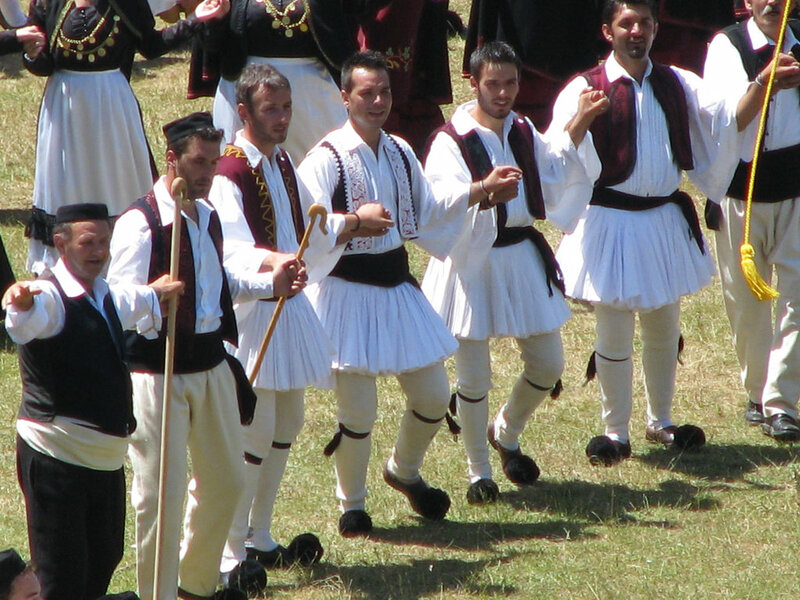 Consequently, there were established several Vlach cultural societies in Greece from the mid-1980s like the “Panhellenic Vlach Cultural Society” and the “Panhellenic Union of the Vlach Cultural Associations”. The first Vlach cultural magazine in Greece (the “Aromanian Chronicle”) started to be printed from 1994, but in the Greek language. Another neo-Latin community in Greece, which is often considered as closely related to the Vlachs, is Megleno-Romanians who undoubtedly speaks a form of a modern Romanian language. The linguistic difference between the Vlachs (or the Aromanians) and the Megleno-Romanians in Greece is only in the fact that the language of the latter is closer to the present-day standardized Romanian. The Meglens of Greece are living in the northern part of the country nearby the border with the FYR of Macedonia and numbering circa 15,000 people. However, there are and the Meglen settlements in the Southern Macedonia as well; thus, the Megleno-Romanians experienced the same political destiny like the other groups of the Vlach community because they are divided by the borders of enlarged (greater) Christian Balkan states at the beginning of the last century. Many Meglens who live in Greece accepted the Greek national identity, but those who live in the FYR of Macedonia in many cases declare themselves as the Macedonians. This double identity is a result of the community strategy to accept in the civic point of view one identity (of macro-community), but in the national (cultural-linguistic) point to have another one (of their own micro-community). Certainly, such strategy brings a variety of practical benefits. A territory of the Former Yugoslav Republic of Macedonia (the FYR of Macedonia; independent from 1991) does not include the whole geo-historical area of Macedonia (the FYR of Macedonia includes 25,441 sq. km. out of 67,741 sq. km. covered by historical-geographical Macedonia). A total territory of Macedonia is stretching from the Shara Mts. and Skopska Crna Gora Mts. in the north to the Olympus Mts. and the northern range of the Pindus Mts. in the south and from the Ochrid Lake and the Prespa Lake in the west to the Rhodope Mts. in the east. The Vlach population of the FYR of Macedonia, according to a census of 1981, was 6,384 or 0,3% out of the total number that was 1,909,146 (of whom the majority have been the Slavo-Macedonians–1,279,323). The Vlachs are in South Balkans spread from West Macedonia to Thessaly and Epirus and half of them are living within the borders of the geo-historical Macedonia. An official number of the Vlachs in the FYR of Macedonia increased, according to the census of 1991: there were 7,764 recorded Vlachs out of 2,033,964 Macedonia’s inhabitants. Today the Vlachs are the fifth ethnic group in the FYR of Macedonia, according to their number (after the Slavo-Macedonians, the Albanians, the Turks and the Gypsies) and compose 0,38% of total population of the FYR of Macedonia. In post-war Macedonia, the biggest number of Vlachs are recorded in the year of 1948 when there were 9,511 Vlachs (0.8%), but the next three censuses (1953, 1961, 1971) did not mention the Vlachs. 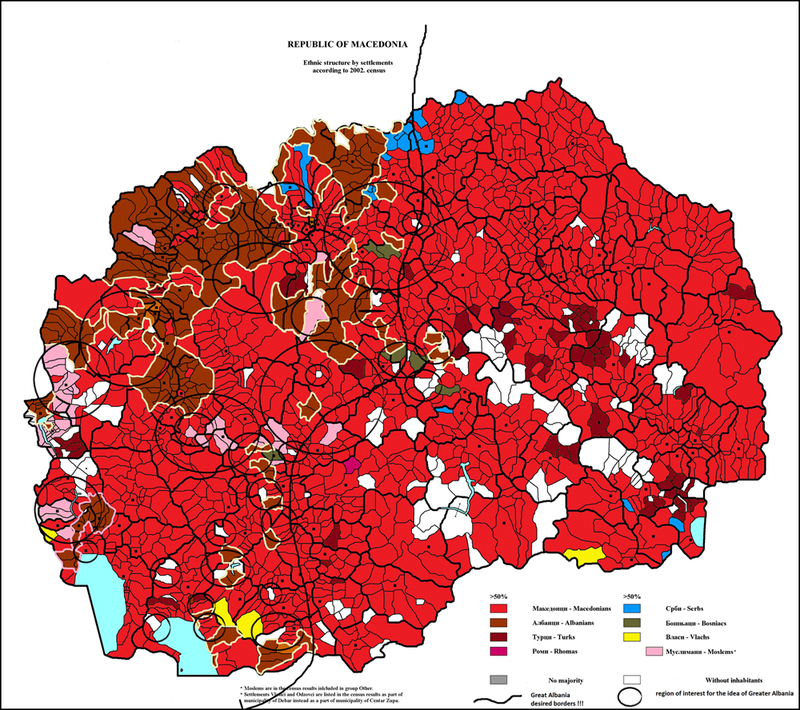 The Vlach community in the post-war FYR of Macedonia was mainly concentrated around the settlements of Bitola (Monastir), Resen and Krushevo (all of them are located in West FYR of Macedonia). In this period the Vlach societies in Skopje and Bitola were most active and they fought for the use of the Vlach language in the schools and for the opening of the Vlach churches in the FYR of Macedonia. One of the biggest problems which met the Vlachs in socialist Macedonia was the Yugoslav legislation that (in 1948) forbade private ownership of a big amount of sheep or horses. It resulted in the practice that an important number of Macedonian Vlachs abandoned nomadic shepherd style of life and became sedentary people. Probably, the crucial feature of the current position of the Vlachs in this Balkan independent state in comparison to the other regional countries is that Macedonia’s Vlachs enjoy a higher level of legal rights and practical implementation of them: they are unambiguously recognized as a separate ethnolingustic minority community in the constitution (adopted on November 17th, 1991); the same constitution allowed the Vlachs, like other minorities, to get education in the mother tongue; the Vlach political representatives are the members of the Macedonian People’s Assembly (Собрание) in Skopje. Markedly, Macedonia’s constitution is the only in the region which explicitly mentions the existence of the Vlach minority. The implementation of constitutional protective measures of the Vlach minority identity in Macedonia is seen through the fact that the Macedonian state TV and radio programs are devoted to the Vlachs for several hours every day. Namely, the second national TV channel and radio, which are devoted to the minority groups, are broadcasting programs of different cultural subjects in the Vlach language with very often diffusion of the songs in the Vlach language from various Balkan areas. It is recognized by the international community that the position of the ethnic minorities in the FYR of Macedonia, in general point of view, is improved in recent times. However, the main pressures from both the international human and minority rights and the local minority representatives on the Macedonian government still are concerned upon the execution of constitutional paragraphs on minority language education. It is true that by now there is no Vlach language school in Macedonia, likewise in the Turkish language. The reluctance of Macedonian government to open minority language schools is first and foremost based on a fear that the Kosovo scenario of minority territorial separation (on the first place of the Albanians) would be inspired by giving the full rights to the ethnolinguistic minorities. The example of Kosovo Albanians, who had a maximum of educational and minority rights in the former Yugoslavia but did not give up an idea of separate Kosovo Republic, warned the Macedonian government to slow down the process of establishment of minority schools for some time, especially after the terrorist actions by the Albanian extremists in West Macedonia in 2001. Nevertheless, the minority representatives, including and those of the Vlach ethnolinguistic community, are constantly urging the Macedonian government to start the course of action in regard to opening the minority-language school education. The local Vlachs are permanently referring to the former time when this community enjoyed this privilege with a financial assistance provided by the Romanian government. The Romanian government, regardless that it did not have a common border with Macedonia, made claims upon the Macedonian Vlachs and established over 30 Romanian language schools on the territory of the Ottoman Macedonia at the turn of the 20th century out of total number of 100 such schools established and financed by the Romanian government in the Balkan areas settled by the Vlachs. This practice was significantly reduced in 1912 with the outbreak of the First Balkan War. However, in inter-war period Romanian government focused its financial and political schooling support to the Romanian-language schools in Bulgaria, especially to the Vlach populated areas of the Vidin district in North Bulgaria, but in Sofia (where it was opened in 1924 a secondary school which was transformed in 1934 into a high school) and other Bulgaria’s regions as well. After the peace treaty of 1919 with Bulgaria, the Romanian embassy in Sofia assumed the main charge of the Romanian-language schools and the Vlach cultural associations in Bulgaria. The climax of Romanian influence on Bulgarian Vlachs was reached when a “Romanian Institute” was active in Sofia in the 1930s, which was the main center in the Balkans of propagation of the Romanian language, education and culture among the Vlachs, but as well and a center for promulgation of the idea of pan-Romanian political unification and a cementation of the spiritual bonds with Romania (considered as a motherland of all neo-Latin speakers in the South East Europe). For the last purpose, it was also established in Bulgaria and a “Romanian Church”. The Romanian government continued to finance Romanian-language schools and churches in Greece after 1919, which have been devoted to the Vlachs (according to the Romanian-Greek agreement) but stopped this practice definitely after 1945. After the destruction of the Socialist Federal Republic of Yugoslavia the Romanian government increased its influence once again in the area of the FYR of Macedonia using the Vlach question as a pretext: in 1991 the Romanian foreign ministry stipulated the recognition of Macedonian independence with Skopje’s giving a high level of rights to the Vlach minority. From that time up today, Romanian government uses periodically the rostrum of the Council of Europe to express its interest in the protection of the Vlach minority rights in the FYR of Macedonia. A high concern on the Vlach issue in Macedonia by Romania could be seen and from the fact that this minority group in Macedonia is usually called by Romanian officials and intellectuals as the Macedo-Romanian. This is because of two reasons: 1) the Romanians consider all neo-Latin Balkan speakers as ethnic Romanian co-nationals, and; 2) many of the Macedonian Vlachs emigrated at the turn of the 20th century to Romania in order to escape a bloody struggle over the province by Macedonia’s neighbors. In inter-war period some researchers recorded circa 4,000 Vlachs in the Bitola area, 3,000 in Skopje and 1,500 in the town of Krushevo that was populated by the Vlach majority. An additional difficulty for the Macedonian authorities to deal most effectively with the Vlachs is the attitude towards this ethnic group posed by the Greek officials who interfere in Macedonian domestic affairs concerning the minority issues. The Athens claims that all Macedonia’s Eastern Orthodox minorities (which include and the Vlachs) are of the Greek ethnic origin and consequently had to be protected by the Greek government. Undoubtedly, there are many regional Vlachs who obtained an education in the Greek language in the schools and accordingly became Hellenized in the matter of cultural and even ethnic feelings. It inescapably produced in the whole 20th century certain level of tensions between those who fought for the Macedonian national idea and those who became champions of the Greek “Megali Idea” (a recreation of united Greek national state, i.e. some form of the former Orthodox Byzantine Empire). Finally, it should be considered the verity that among all scattered Vlach communities in the region (from the 2,000 of Istro-Romanians in the north-west of the peninsula to the several tens of thousands of the Vlachs in Thessaly and Epirus in the south-eastern parts of the Balkans) the Macedonian Vlachs have the best chances to preserve their ethnocultural characteristics due to the favorable legislation and practice in protection of their identity. H. Poulton, The Balkans. Minorities and States in Conflict, London: Minority Rights Group, 1994, p. 189. Regardless that some of the Vlach emigrants from Greece claim the figure of 600,000 of the Greek Vlachs the “Federal Union of European Nationalities” estimated the real number of the Vlach population in Greece up to 300,000 [Information, Federal Union of European Nationalities, Flensburg, Austria, March 29th, 1990, p. 7]. H. Poulton, The Balkans. Minorities and States in Conflict, London: Minority Rights Group, 1994, p. 175. Many Vlachs who identified themselves as the Greeks, since received Greek education and had services in the Greek churches, had significantly contributed in the Greek struggle for independence from 1821 to 1830. Present-day Vlachs in Greece do not have any separatist intentions since they are descendants of those Vlachs who opted to stay in Greece at the beginning of the last century, but not to migrate to Romania. Vlach representatives complained several times to the European Community’s (now Union’s) “Bureau of Lesser Known Languages” upon the neglecting the usage of the Vlach language in Greece. However, some of the leading Vlach figures in Greece did not support those critics and openly defended the standpoint of the Greek government. Nevertheless, the Vlach émigré organizations in France, Germany, the USA, etc. on their regular meetings are heavily condemning the Greek linguistic policy and especially the practice that the Greek Vlachs are pressed to use the Greek alphabet in order not to antagonize the local authorities. The Vlach diaspora is fighting for the use of the Latin alphabet like it is a practice in Romania (after 1863). A historical-geographical Macedonia was divided in 1913 between Serbia, Bulgaria, and Greece. This Balkan province was occupied by the Ottoman Turks in 1371 and liberated from the Ottoman lordship in 1912. About the Macedonian issue see [H. Poulton, Who are the Macedonians?, London: Hurst & Company, 1995; L. M. Danforth, The Macedonian Conflict. Ethnic Nationalism in a Transitional World, Princeton: Princeton University Press, New Jersey, 1997; H. N. Brailsford, Macedonia: Its Races and their Future, London: Methuen & Co., 1909; J. Pettifer (ed. ), The New Macedonian Question, New York: St. Martins Press, 1999]. V. Andreev (and others), The Republic of Macedonia, Skopje, 1995, pp. 2–3. Romanian struggle over Macedonia lacked in comparison with Bulgarian, Serbian and Greek efforts a national clergy, which will attract the Vlachs to Romanian church, but not to the Bulgarian, Serb or Greek ones. Anyway, the Ottoman authorities supported Romanian efforts at the expense of the Greek Patriarchate especially in the Bitola district in Macedonia. After diplomatic intervention in Istanbul by the Romanian ambassador in 1903 it was established a separate Aromanian ecclesiastical autonomy in Macedonia. The “Romanian Church” was consecrated in Sofia in 1923. However, the “Aromanian Church” existed in Bulgaria (in the town of Gorna Djumaya) from 1906. Both of them played an important role in the formation and maintenance of the Aromanian ethnocultural and linguistic identity. Undoubtedly, due to the activities of aforementioned institutions, together with the Aromanian Youth Association (established in 1923), the Aromanian language, traditions and customs were very much preserved in Bulgaria. These institutions have been closed in 1948 when the People’s Republic of Bulgaria became fully involved into the Soviet political-economic bloc. After 1948 the Aromanians in Bulgaria have been officially considered as the Vlachs and later as ethnic Bulgarians who spoke a neo-Latin language. It was established in Bucharest at the turn of the 20th century most important Vlach cultural organization under the name of Macedonian-Romanian Society for Intellectual Culture. This organization was during the First and the Second Balkan Wars (1912–1913) the main proponents against a territorial division of Macedonia between Serbia, Bulgaria, and Greece. Instead, it fought for Macedonian autonomous province. The same Vlach organization was presented at the Versailles Peace Conference in 1919 requiring the establishment of autonomous Macedonia with an independent canton for the Vlachs, which will include the area of the Pindus Mts. The Italians established during the Second World War in Greece an autonomous “Pindus Principality” under their own protectorate that was considered as the Vlach ethnic state in this portion of the peninsula. The area of the Principality covered Epirus, Macedonia, and Thessaly. The prince was Alcibiades Diamandi. The Principality had and its own armed forces – the “Roman Legion”, composed by those Vlachs who supported Italian fascism. About this issue see [E. Averoff-Tossizza, The Call of the Earth, New York: New Rochelle, 1981]. H. Poulton, Who are the Macedonians?, London: Hurst & Company, 1995, p. 94. About the “Megali Idea” in connection with the Macedonian question see [T. G. Tatsios, The Megali Idea and the Greek-Turkish War of 1897: The Impact of the Cretan Problem on Greek Irredentism, 1866–1897, New York: Columbia University Press, 1984; D. Dakin, The Greek Struggle in Macedonia 1897–1913, Thessaloniki, 1966].